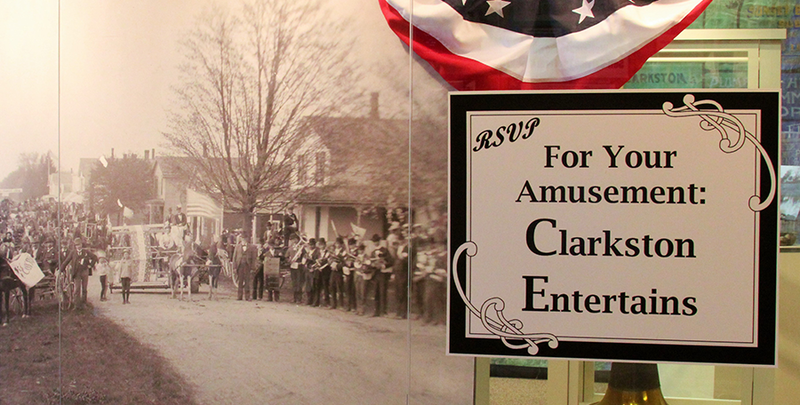 In 1999, the CCHS opened the Clarkston Heritage Museum in an effort to preserve and interpret our local history. As Clarkston’s only museum, we have successfully hosted thousands of visitors and we continue to grow and evolve. Exhibits are changed twice a year to reflect a new theme. Over 30 different displays have been designed, installed, and enjoyed by the public since 1999. The exhibits always attempt to connect the past to how we live today, because it makes history interesting and relevant. These creative endeavors are funded with the proceeds from Art in the Village, which is the society’s main fundraiser, as well as society memberships and monetary donations. The museum also gathers and preserves important Clarkston artifacts donated to and purchased by the historical society. We feel that this is an important responsibility, meeting our Mission “to collect and/or preserve such things that are of historic interest.” We are proud of our Collection and the exhibits it allows us to showcase. The Clarkston Heritage Museum is self-guided and conveniently open during all regular Clarkston Independence District Library hours. If arranged in advance, a museum volunteer can help facilitate group visits. Call the office at 248-922-0270 for further information. The Clarkston Heritage Museum is located within the Clarkston Independence District Library at 6495 Clarkston Road, Clarkston, Michigan. Hours are Monday through Thursday, 10 a.m. – 9 p.m., Friday and Saturday, 10 a.m. – 6 p.m. and Sunday, 1 p.m. – 6 p.m. The Museum is always happy to accept historical Clarkston documents, photographs, or artifacts for our collection in an effort to preserve them for future generations. Respectful effort will be made to preserve them for future generations. Another way to support the museum is to consider a financial donation. The historical society is a 501C-3 charity and donations are often tax-deductible (consult your tax advisor). To donate artifacts or to make a financial contribution please contact Toni Smith, our Clarkston Heritage Museum Director at 248-922-0270.